This was the perfect cookie for kids that love to play dress up and dream of being a ballerina. 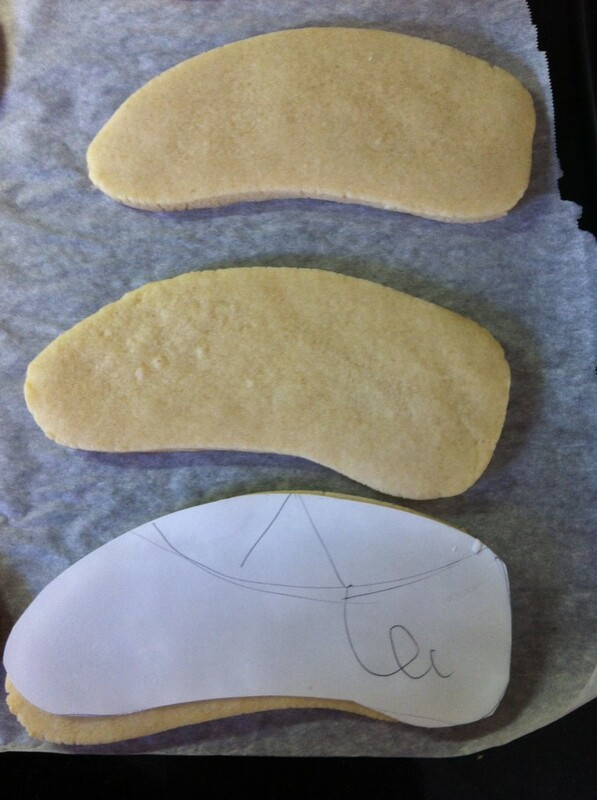 After searching high and low for the right ballet slipper cookie cutter, I ended up hand cutting them. Here is the paper template I drew. Next comes the fun part and also the part that takes patience. 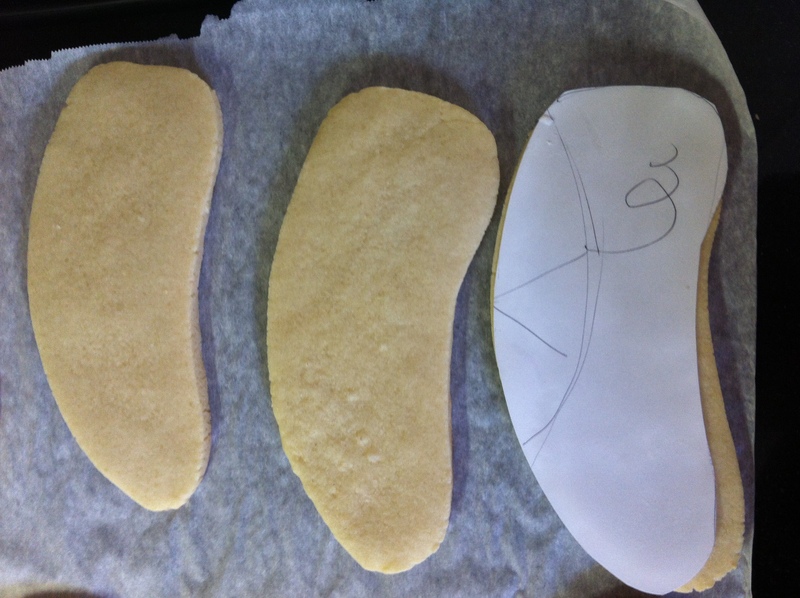 Icing is a step by step process: 1. 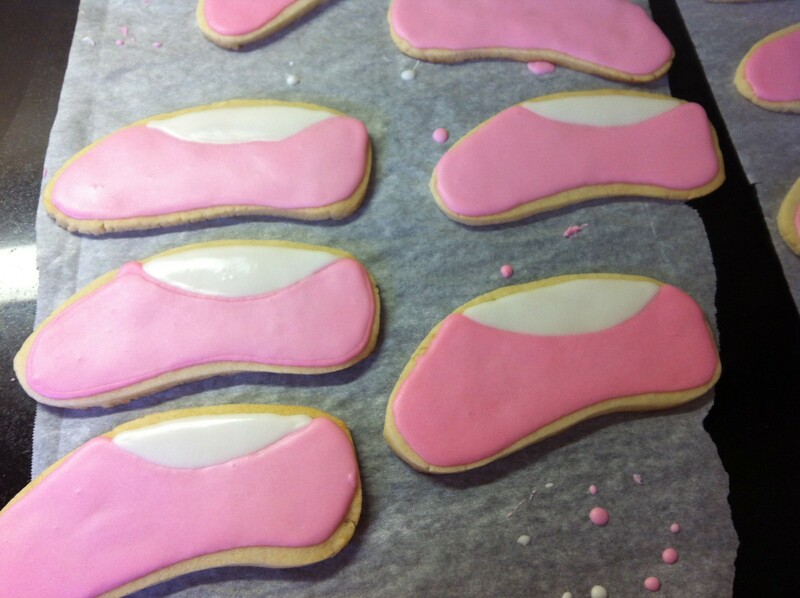 Outline in pink. 2. Flood in pink. Then wait to dry at least 4 hours. 3. Flood the top of the foot white. 4. 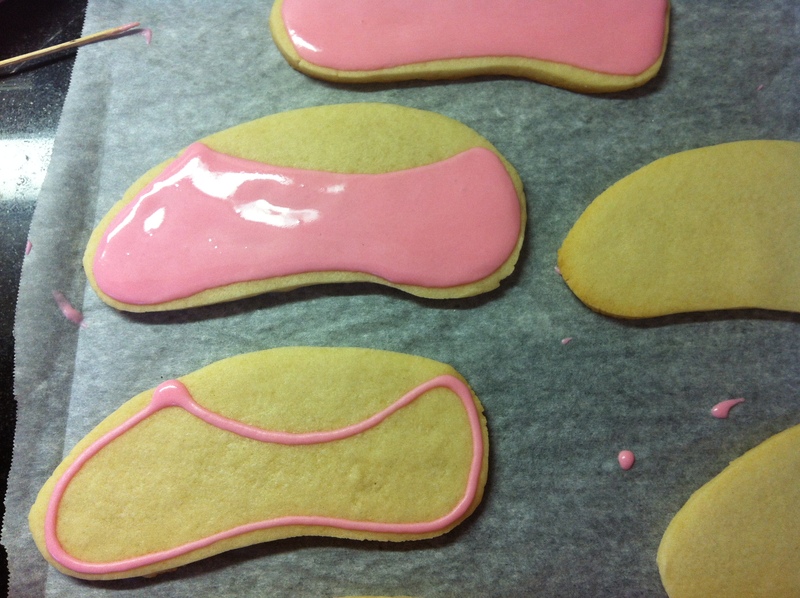 After everything is dry, use a piping consistency pink to do the details over the top. I generally use a #1 tip. 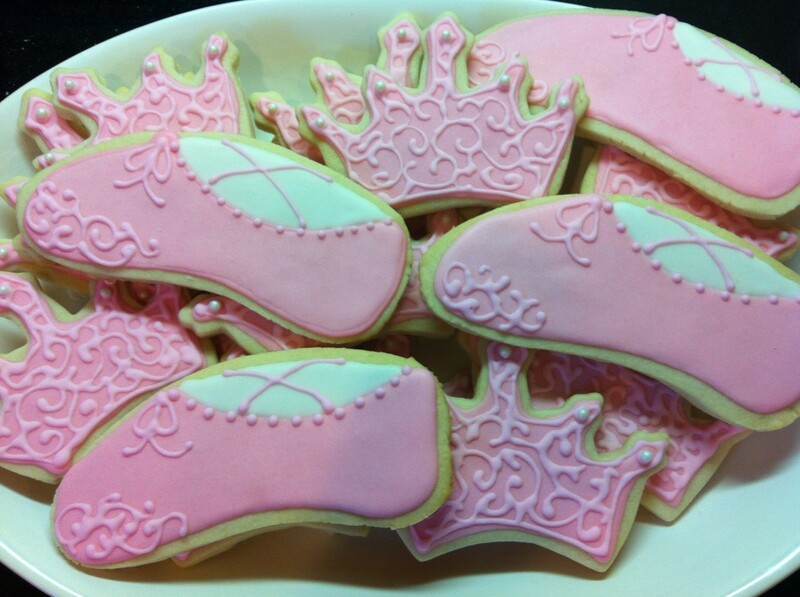 The princesses now have their slippers and just needed some tiaras to go with them! 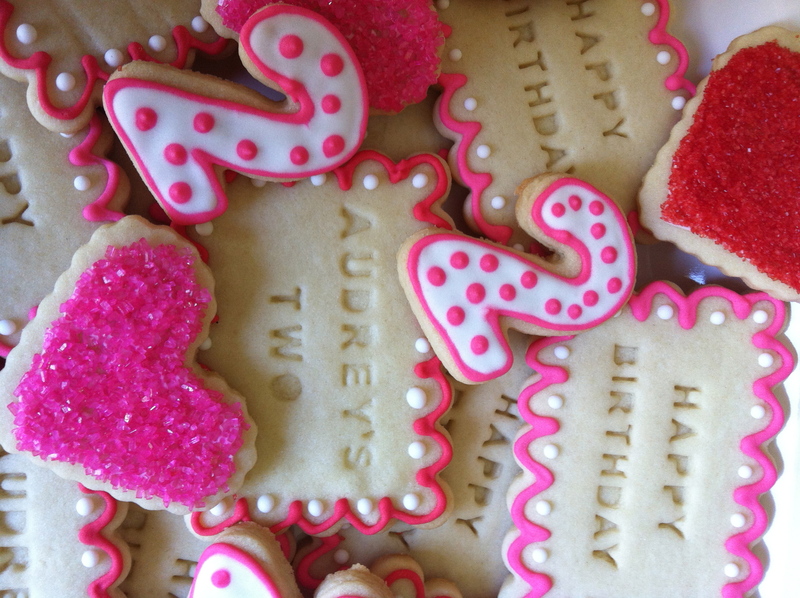 Here is the final platter with both cookies. 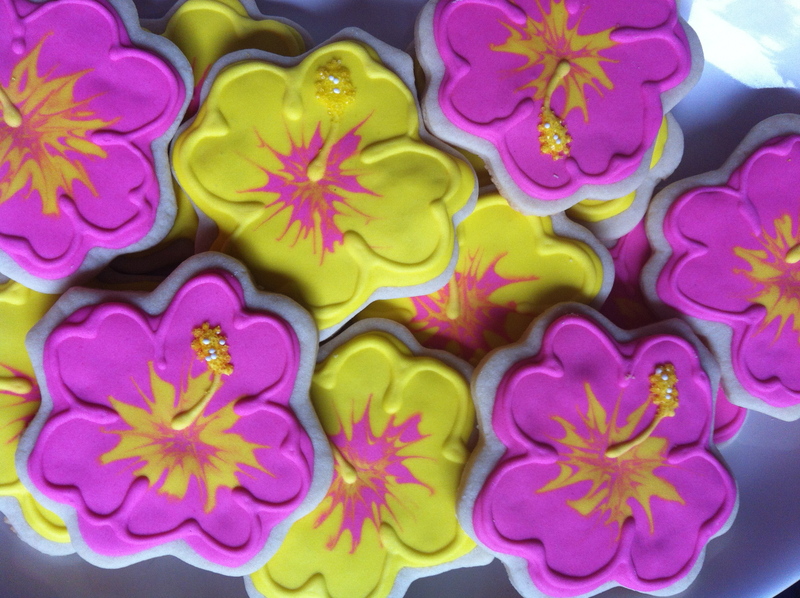 Countless cookie ideas came to us when we were asked to bake some treats for a farewell party for a friend who’s sister was moving to Hawaii – our minds went wild with possibilities – giant sea turtles, pineapples, surfboards, palm trees – all of course bright and colorful, just like the islands … and that lovely flower that litters the landscape, the plentiful hibiscus. 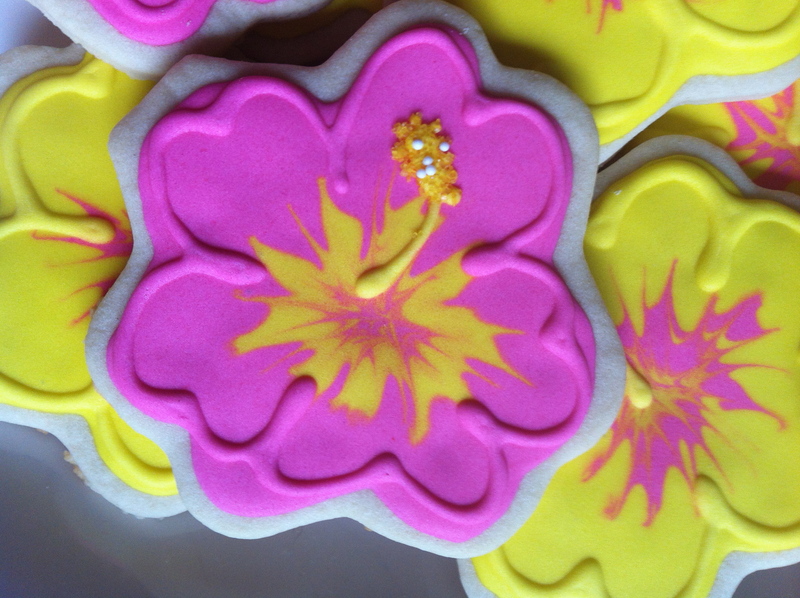 Once we decided on our theme, we realized we didn’t have a cutter for the hibiscus, not that it mattered, we ended up bending a clover cutter into the shape we needed like many bakers do. 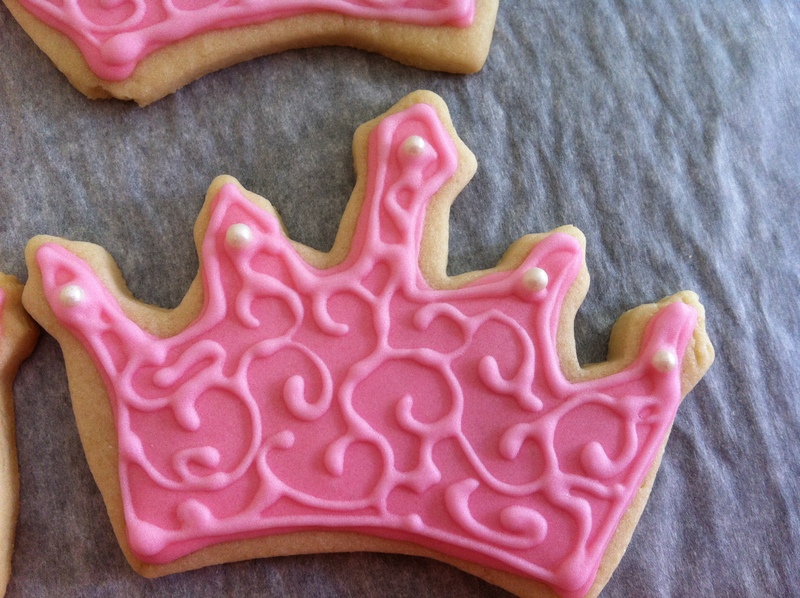 Check out Glorious Treats Blog for this and other amazing cookie tutorials! Our friend asked for bright colors, we chose hot pink and yellow, dusting the stamen with yellow chunky sugar. 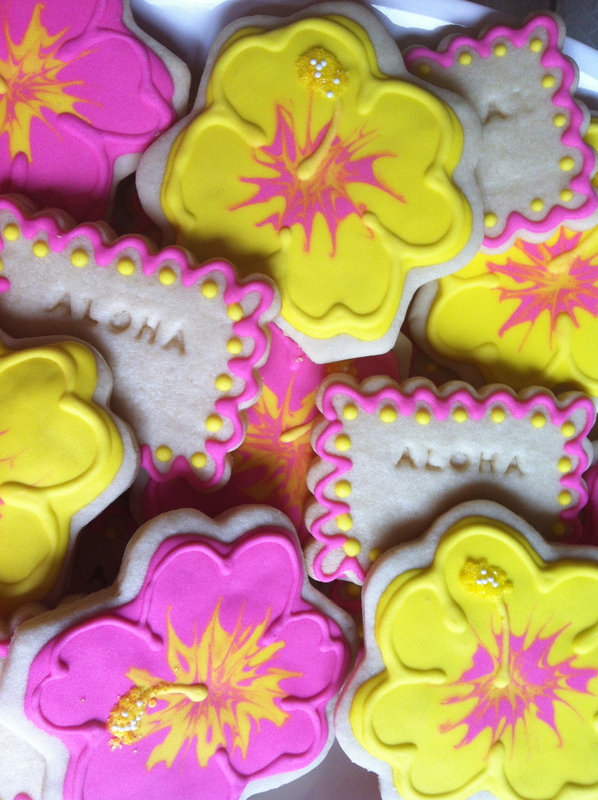 We also made some “Aloha” message cookies to go with them. Aloha Michelle! Do you know what a fleur-de-lis is? 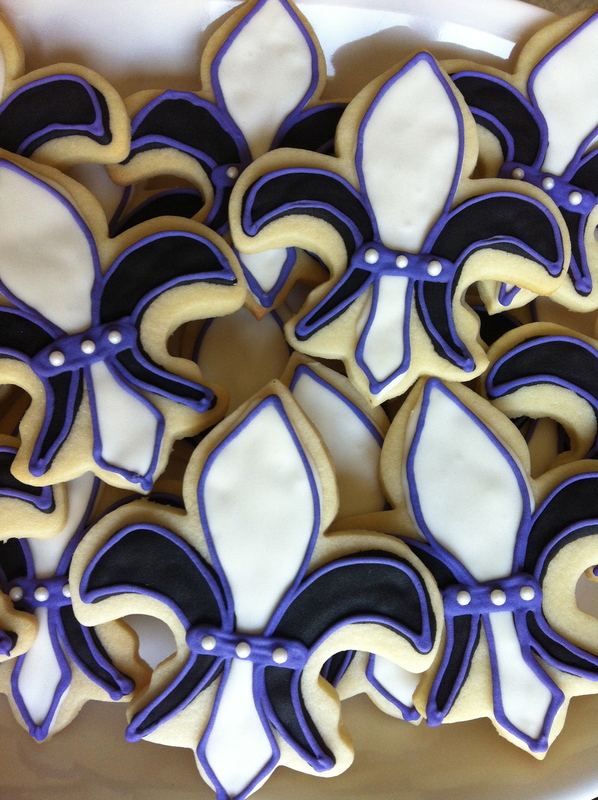 When I showed my brother these cookies he asked me why I was routing for the Saints! 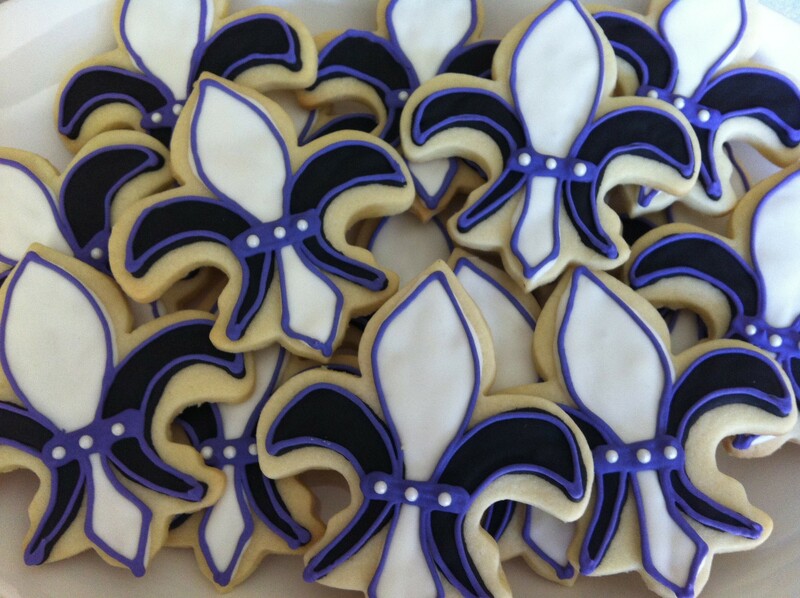 We made these for a black and white themed-bridal shower, accenting them with the bride’s favorite color, purple. We used white sugar pearls on the tie of the flowers and to our purple outline, we added a shimmer by making a wash with some disco dust! 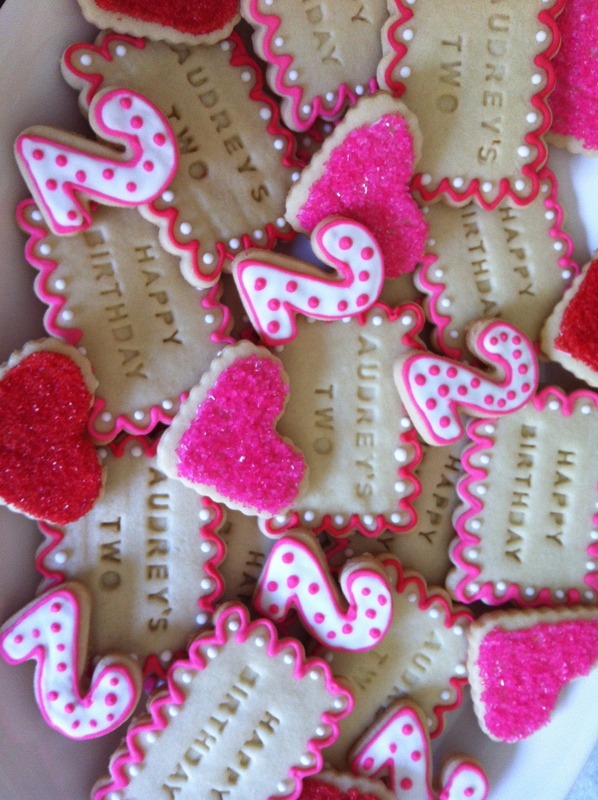 Individually wrapped, these cookies were used as party favors. 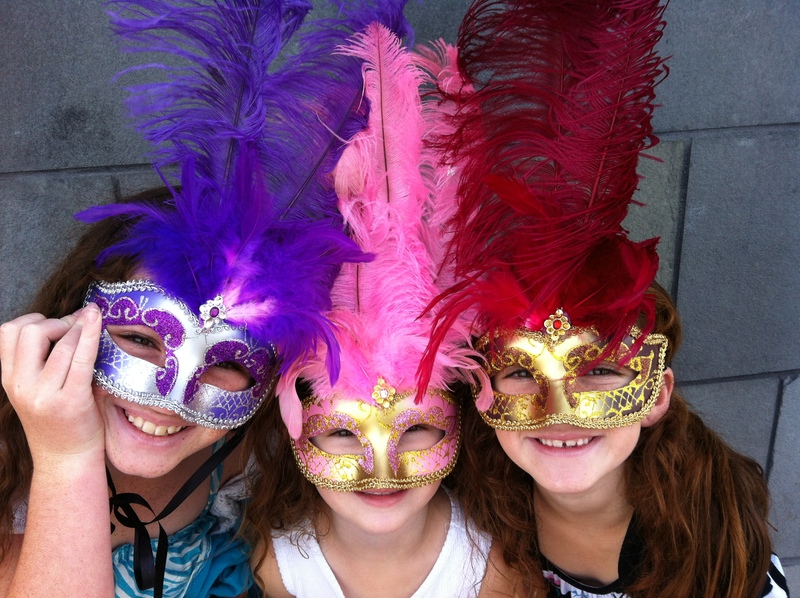 We’re already thinking these could be really fun for Mardi Gras 2013! 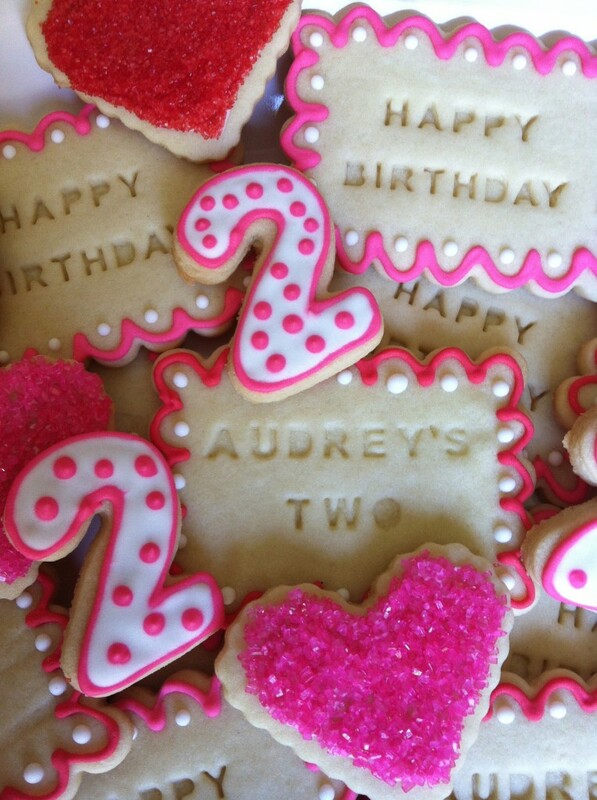 Happy 2nd Birthday to our little cousin! Her parents wanted a Hello Kitty theme with all the bells and whistles. 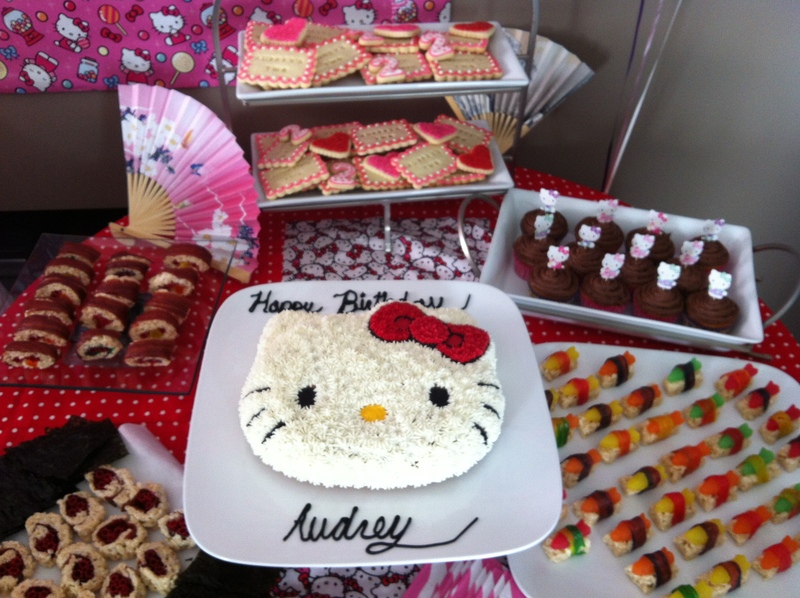 They went all out on the dessert table…complete with sushi Rice Crispy treats made by her dad, an awesome cake made by her mom, and some of our custom cookies! 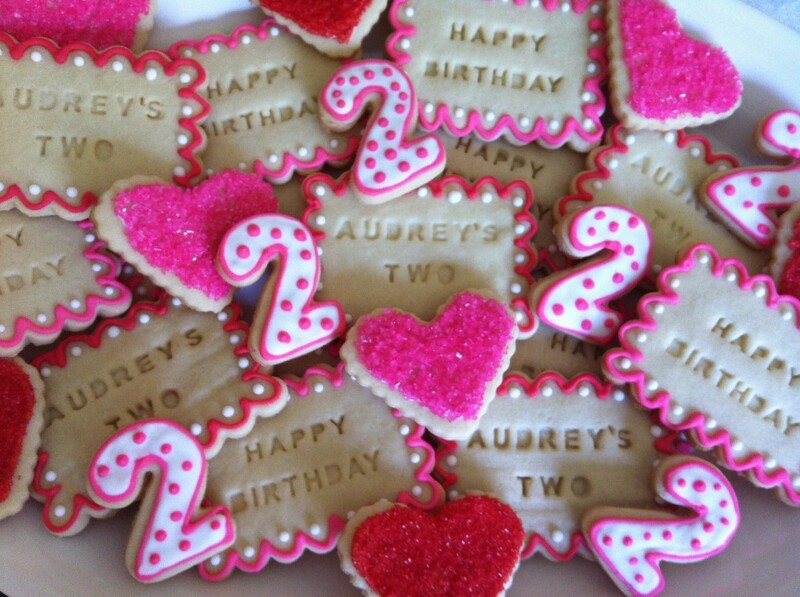 We made message cookies that said “Happy Birthday” and “Audrey’s Two.” We also made number “2” cookies and some sprinkled hearts. The dessert table look impressive and tasted just as great! 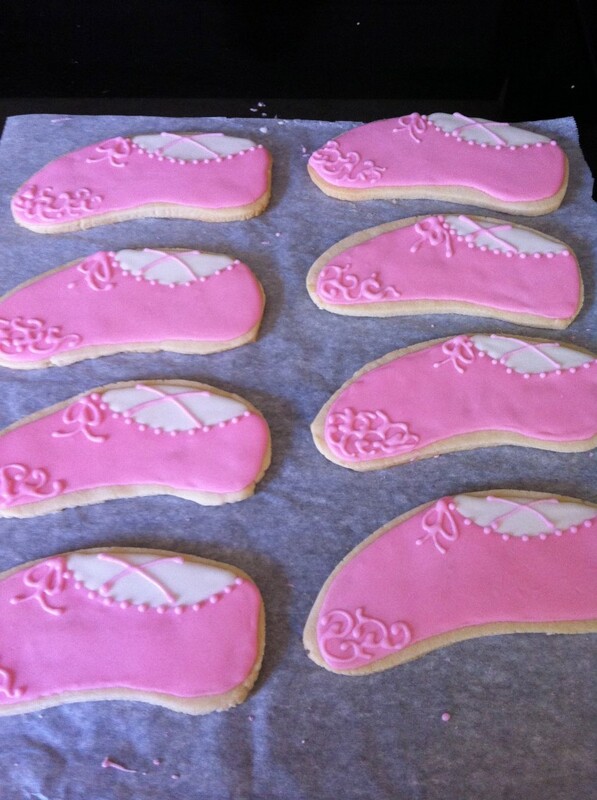 Here’s another look at the cookies….